Following deliveries of crew transfer boats and other ProZero workboats to Norway, Danish boatbuilder Tuco Marine said it has concluded another delivery of a 15m high-pressure cleaning boat to Norwegian AKVA Marine Services. 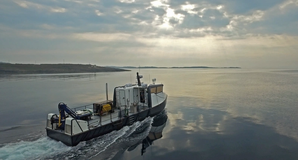 The workboat is the second 15-meter high pressure cleaning boat that AKVA Marine has taken from Tuco. It was sold in collaboration with Tuco Marine's local partner on the fish farming market. The 15m ProZero HPC boat is built from composite materials, reducing the structural weight of the vessel and ensuring low maintenance and superior durability. The hull structure for this particular ProZero model features special appendages and reinforcements that make it suited for fish farm operations. The ProZero hull provides for a stable ride, even in rough seas. Thanks to the low weight and the twin inboard diesel engines connected to the Volvo Penta IPS propulsion system with forward-facing, counter-rotating propellers, the vessel is capable of operating at more than 33 knots. According to the builder, the union of low weight and efficient propulsion results in impeccable control and handling, world-class fuel efficiency and minimal environmental impact. The cockpit layout in the workboats is arranged to maximize the use of state-of-the-art operations management and situational awareness electronic aids.